Vertebroplasty involves the injection of polymer materials into painful osteoporotic vertebral fractures in an effort to approximate the former shape and weight bearing of the damaged vertebral body. Although very frequently performed (tens of thousands have been performed in the U.S. alone), there have heretofore been no rigorous trials evaluating vertebroplasty against a true placebo in blinded fashion. To address this knowledge gap, two concurrently published studies (Buchbinder et al and Kalmes et all. NEJM 2009; 361(6): 557-568 and 569-579) report the efficacy of vertebroplasty vs. sham vertebroplasty on pain and disability in individuals with painful osteoporotic fractures. Buchbinder et al. 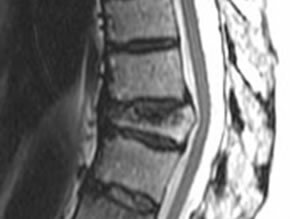 Patients with one or two new painful vertebral compression fractures (less than 90% compressed) without spinal malignancy, fracture through the posterior wall, or neurologic manifestations, were randomized to receive percutaneous vertebroplasty, or a sham procedure in which a needle was inserted in a similar way as the authentic procedure, but no polymer was injected. The patients and all outcome assessors were blinded to treatment allocation. Patients were evaluated for overall pain (primary outcome), quality of life, and disability using mailed questionnaires at baseline, 1 week, and after 1, 3, and 6 months. Kallmes et al. Patients aged 50 years and older with one to three painful vertebral compression fractures between T4 and L5 of less than one year since fracture were randomized to receive percutaneous vertebroplasty, or a sham procedure similar to the one described above. Patients were evaluated at baseline, and at days 3, 14, and 90. The primary outcomes were disability (based on a modified version of the Roland-Morris Disability Questionnaire (RDQ) and intensity of back pain. Other pain rating instruments and quality of life were assessed as secondary measures. As in the Buchbinder et al. study, patients and outcome assessors were blinded to treatment allocation. Buchbinder et al. A total of 468 individuals were screened, out of which 78 were randomized (38 to vertebroplasty and 40 to sham). Complete 6-month data were available on 71 (35 in the vertebroplasty group and 36 in the sham group). There were 3 deaths, all unrelated to the procedures. Enrolled participants were an average of approximately 75 years of age and mostly female (80%). Pain scores were high, on average (7.2 out of 10) and balanced between groups. The majority of patients in both groups were receiving opioids for pain (82%). Approximately half of the enrolled patients had prior vertebral fractures. Changes in pain were similar in both groups at all time points. At one week, most (around two-thirds) of participants reported no change in pain. At 6 months, almost half reported improvement in pain, a third reported no change, and a minority (approximately 15-20%) reported worse pain. There were no significant differences between the groups in the secondary outcome measures of disability and quality of life. Kallmes et al. A total of 1,813 individuals were screened, out of which 131 met inclusion criteria and agreed to participate and were randomized (68 to the vertebroplasty group and 63 to sham vertebroplasty). Complete 3-month data were available in 125 (64 in the vertebroplasty group and 61 in the sham group). No deaths occurred. Similar to the Buchbinder at al study, enrolled patients were approximately 74 years of age and mostly female (75%). Pain scores were high, on average (7.0 out of 10) and balanced between groups. Approximately 60% of participants were using opioids for pain. At one month, both disability scores and pain intensity scores had decreased to the same extent in both groups, with no significant difference between groups. Similarly, there were no significant differences between the groups in any of the secondary outcomes. Within groups stratified by those who crossed-over to the alternate procedure at 1 month, 3 month disability and pain intensity scores did not significantly differ by treatment allocation. Vertebroplasty was not better than a sham procedure for the treatment of painful osteoporotic vertebral compression fractures. The results of these two studies are quite astonishing and question the use of a procedure that has become commonplace, albeit with little prior rigorous evaluation. Prior studies on which advocates of vertebroplasty based their enthusiasm did not evaluate efficacy against a comparable placebo group, and most demonstrated a benefit of the procedure in pain relief, improvement in physical function, and quality of life. However, as the two studies presented here so elegantly demonstrate, the natural history of vertebral fracture is improvement over time, at a rate not influenced (either positively or negatively) by the vertebroplasty procedure. There are some issues with the studies that could limit their generalizability. For one, each of the studies had a larger number of eligible patients refuse to participate than were randomized. While inclusion of these individuals may have resulted in the overall temporal differences in outcomes looking a little different (perhaps less regression to the mean), the differences between the groups would not have been affected. Overall, the publication of these two studies raises the question of whether there are any patients who would benefit from vertebroplasty. Should the procedure be abandoned? Based on these findings, there would seem to be little additional benefit, over and above standard analgesia and waiting, to performing the procedure. Additional rigorous study would be needed to prove that specific subgroups of patients would benefit from the procedure.